California Golden Retriever Rescue View other Golden Retrievers for adoption. To meet our dogs please go to our website: www.happyheartsgsr.org and complete an application. 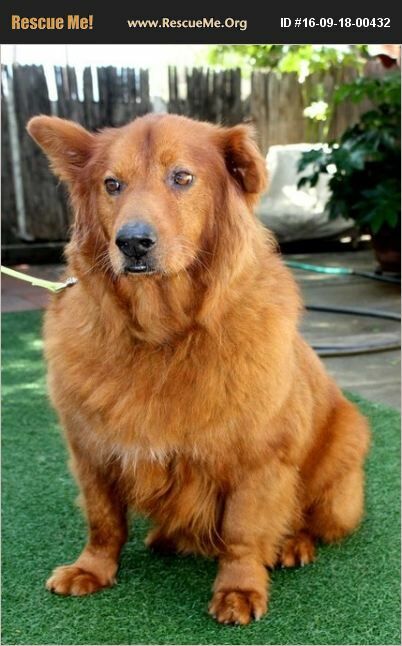 Coppertop is a lovely fat little Chow/Golden Retreiver mix of about eight. He is sweet and gentle and is a perfect companion dog. He walks well on leash and knows his basic commands. He is house trained and polite and non intrusive. He loves his walks, about a half hour morning and night. He is good with other dogs seems ok with cats although he hasn't been tested. He adores people although he is aloof and ignores people until he gets to know them. He loves to hang out with you wherever you are, watching tv or especially cooking dinner. He trots and prances when he sees a leash or a food bowl. He wants to sleep close to where you are and is protective of home and property. He is a great guard dog, always alert to anyone coming into the yard uninvited. He is very mellow but full of life and loves going wherever his person is going and exploring new things. He is very smart and curious about his world. He has no bad habits and is safe inside the house where he spends most of his time. He needs an adopter in the San Diego area so he can be transitioned from his foster in La Mesa. To meet our dogs please go to our website: www.happyheartsgsr.org and complete an application.